My bullet point about the Decatur EDC purchasing the land from the "Wise County Consortium" (what is that and who is involved?) gave rise to a comment I didn't post because I can't verify it. I know I'm being vague because I have to. But it was fascinating. The Supreme Court has agreed to hear two cases involving automobiles and the Fourth Amendment. I love this stuff. Cowboy's Sean Lee is hurt again.What else is new? Face Blindness actually has a name. It's called Prosopagnosia. And head injuries can cause it yet leaving you with all other cognitive skills. All my good friends know I suffer from it. It's frustratingly bizarre. 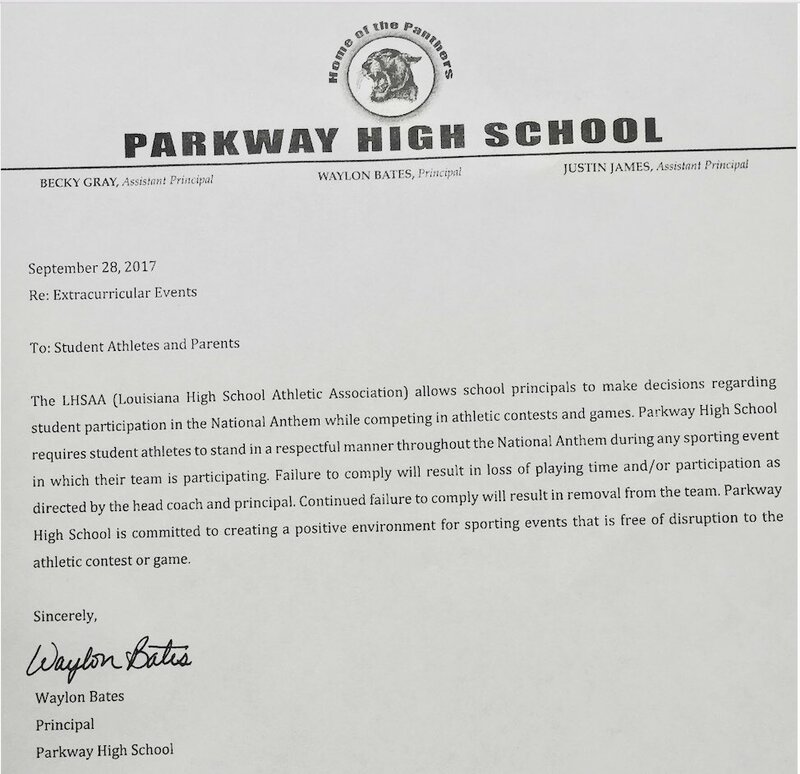 Below: A letter from a high school principal telling student athletes they cannot kneel during the national anthem. He should be fired because of his basic ignorance of the constitution. 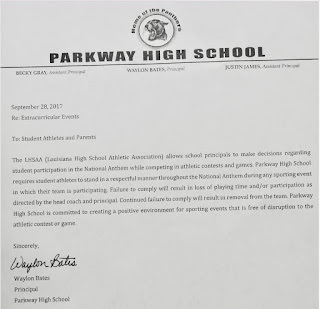 The government, and, yes, a public school is the government, cannot tell any student to do this. Tarrant County DA Sharen Wilson released a list of financial supporters. The number of criminal defense lawyers on it is shocking and proof that we need District Attorneys appointed and not elected. And I encourage you to click on the link just to see how she labels the levels. The Texas State Fair starts today. #NeverForget. Good lord, the goofy Texas Supreme Court judge, Don Willett, will be appointed by Trump to the federal Fifth Circuit Court of Appeals. Make no mistake about it, the guy is a fraud. He's a conservative judicial activist who used Twitter to come across as an "Aww Shucks" yokel using dad jokes and pictures/exploitation of his kids to endear himself to the Bubbas of the world. 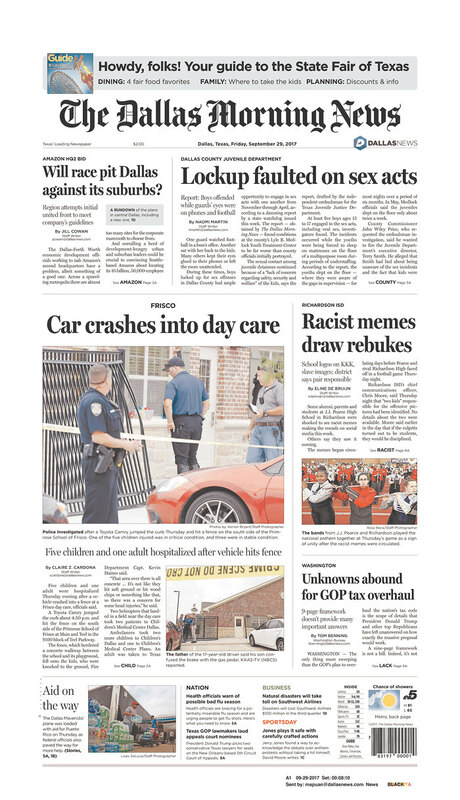 And an appointment to a federal appeals court? Normally that is reserved for federal district court judges who know at least something about federal law. It's a lifetime appointment, by the way. This pic is from yesterday. And right now these lyrics popped into my head: "Yesterday all my troubles seemed so far away. Now it looks as though they're here to stay. Oh, I believe in yesterday." Shout out to the City of Bridgeport for being very responsive to a request I had.